The English word for “koi” comes from the Japanese word used for “carp,” koi being a brightly-coloured type of Amur carp. Koi have been bred for their colour since 1820 in Japan. The benefits of owning koi are many. Studies have even shown that stroke victims who are owners of koi ponds are likely to have better recovery times than those without these fish! 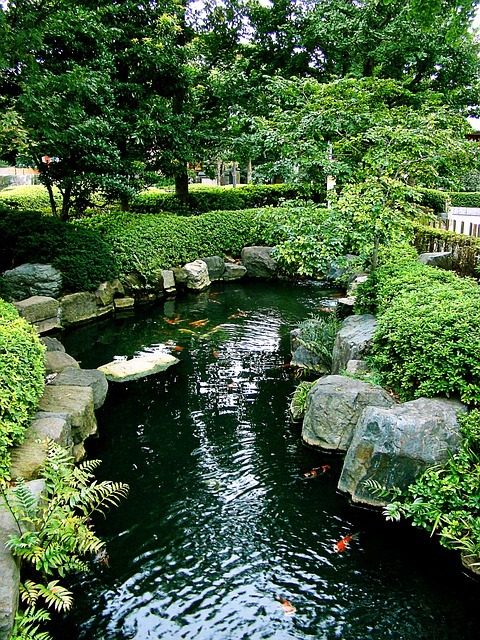 Most owners simply enjoy the tranquillity afforded by their koi ponds, feeding the koi by hand. Some can even make a bit of extra profit by selling healthy koi on the side. You can expect your koi to live in the region of 15 to 20 years, and greater ages are common. But to see your koi enjoy a healthy lifespan like this, you will need to keep your koi pond clean. Here are some easy steps to make sure that you have a clean koi pond and healthy koi. It is very important to only feed your fish as much they should eat. Overfeeding the koi is bad for them and means build up of uneaten food in the pond. Overfeeding leads to poor water quality. This leads to further, more difficult maintenance issues later on. For example, excessive levels of nitrates and ammonia in the water, which can become fin rot and other diseases of the koi. Not to mention parasites! Feeding koi by hand is a good way to measure their intake and make sure that it is appropriate. Aquazoi stocks the best koi food products on the market, selling both to the public and distributors. Whatever your needs whether private or commercial, we can get you the koi food you need. Koi are cold-water fish and can even hibernate under ice so Joburg winters won’t be a problem for them. But the other side of this coin is that the fish won’t thrive in water which is too warm. To ensure that there is no undue build-up of fish waste and run-off that’s nutrient enriched, regular water checks are very important. A heavy thunderstorm, or a persistent period of rain, can throw the pH levels out of balance. You should always track both temperature and pH levels. Aquazoi’s staff will be able to provide you with the best tools to check the water and to fit your budget. 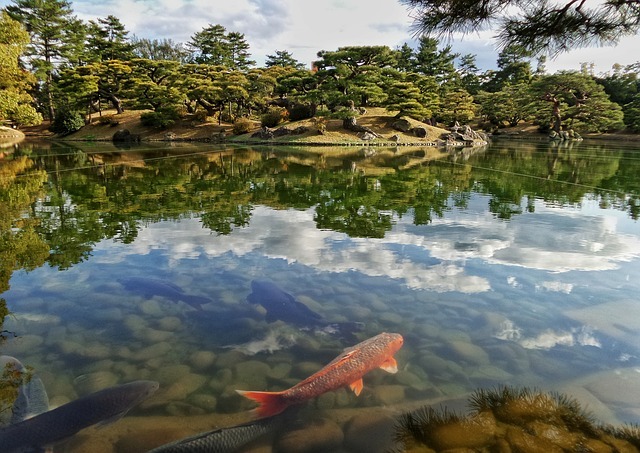 It has been said that for most people maintaining the filter will be the biggest job when it comes to your koi pond upkeep. Thanks to advances in filtration equipment, the maintenance isn’t as labour-intensive as it was a few decades ago. But necessary maintenance must still be performed. The best systems consist of a quality filtration, a powerful pump, an aeration system and ultraviolet sterilizer, plus a protein skimmer. The protein skimmer goes a long way to keeping the surface of the pond clean. Our staff is ready and happy to assist with any of these items. With a weekly maintenance schedule, you will ensure healthy koi and keep your filter equipment running at its best for longer. This would involve flushing water through the filters, which will remove any solid debris building up. A 10% water change is also recommended so that vital trace elements are replaced in the water. It also ensures removal of waste build-up (the nitrates and fish waste). Trace elements should also be supplemented. Ask our staff for the best trace element supplement for a koi pond, to fit your budget. To help prevent algae build-up, Algclean is a great option. This product is fully organic and natural, and safe to use for the koi, plants and humans, as well as birds and other pets. Making it part of the monthly maintenance plan should ensure that algae never detracts from the beauty of your koi pond.